Recently, the Los Angeles Unified Board of Education voted to place Measure EE on the ballot in a special local school funding election on June 4, 2019. 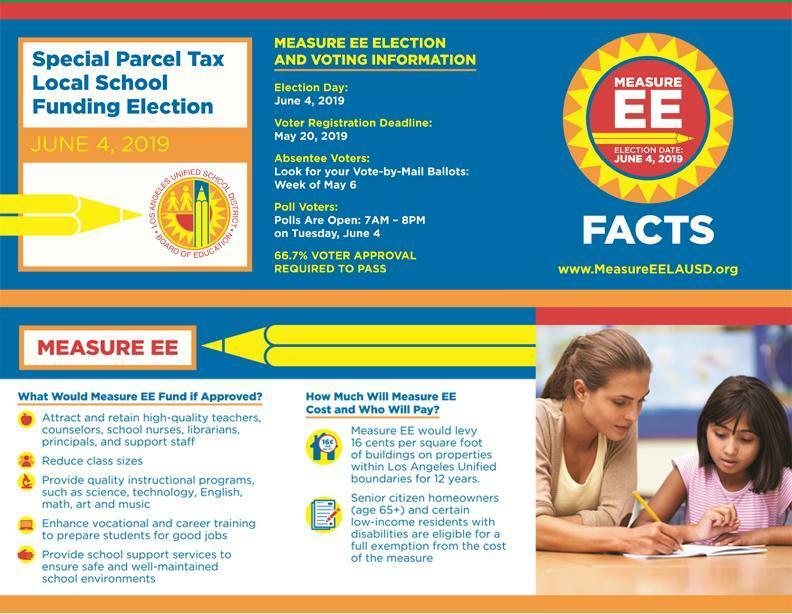 If approved by 66.67% of voters on June 4, 2019, Measure EE would provide funding to support Los Angeles public schools through a 16-cent per square foot school parcel tax for 12 years. Senior citizens and certain low-income property owners with disabilities would be eligible for an exemption. Measure EE funds would be used to retain and attract quality teachers, reduce class sizes and support instructional programs in arts, music, science, technology, English and math. By law, all Measure EE funds must be used to support Los Angeles public schools and could not be taken by the State. As a reminder, the deadline to register to vote in the June 4 election is Monday, May 20. 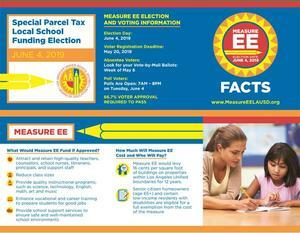 More information about Measure EE and about voting in the June 4 election is available at visit www.MeasureEELAUSD.org.